I’ve been avoiding the wireless headphone trend. I like to pretend it doesn’t exist – that phones still have headphone jacks and wires are still a thing. Why, you may ask? Because I have the unique ability to lose anything smaller than a wallet if it’s not attached to me. Even my keys are on a long band that I hook onto my purse strap when I leave the house. Now that you know this fun little tidbit about me, you’ll understand when I say I was sceptical when I got my SoundBuds Curve Wireless Earbuds from Anker. My first surprise (which is largely due to my ignorance about wireless earbuds) was that the earbuds are connected with a wire. This wire, combined with the small clamp included in the box, made me feel a lot more assured that I wouldn’t lose this audio-providing device. 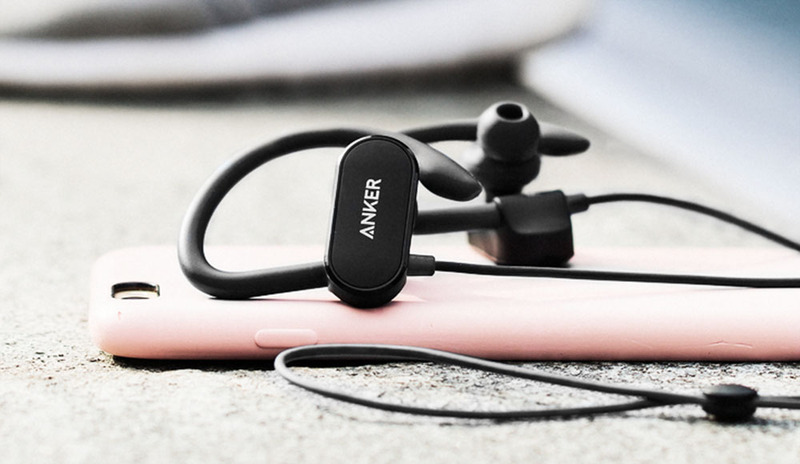 The earphones connect with Bluetooth 4.1 and come with an ear hook and water resistant coating. Connecting and disconnecting the earphones took a little bit of practice – you have to hold the play button down for five seconds until you see a blinking blue light (then you can pair it with your device); turning it off, the process is repeated until you see a solid red light. In addition to the clamp, the box came with several different sized “tips” (the part that goes on the ear bud and holds it in your ear) – which means that you’ll be able to find the “tip” that is the most comfortable for your ear-holes. Most of the tips are silicone but one pair is memory foam. The memory foam tips were interesting to try; they’re very squishy and conform to the shape of your ear. Unfortunately, they are a bit too big for me. I like the fact that I can customize the earbuds so that they are as comfortable as can be. SoundBuds Curve are noise cancelling, a feature I miss out on with my wired headphones. I honestly haven’t had the volume on my device up more than half, because I just haven’t needed to turn it up. (With other headphones, I have to put it much louder just to hear the music over the ambient noise). The battery life on the SoundBuds is amazing. I’ve used them for at least an hour a week for the last two months and haven’t had to charge them as of yet. According to the product page, it should get in about 12.5 hours of playtime, and I don’t doubt this at all. So, I am converted, for sure. The SoundBuds Curve Wireless Earbuds are the only way I will listen to music when I’m out and about. If you’re looking for a good around-the-house bluetooth speaker, read this review of Anker’s SoundCore Boost.